Nanomedicine: the next breakthrough in oncology? The advent of biotechnology helped the pharmaceutical industry to achieve some of its biggest breakthroughs in the last few decades, leading to the discoveries which alleviate and prolong lives of countless patients suffering from autoimmune diseases and cancers. Could the emerging nanotechnology usher in the same breakthroughs and lead to another golden era in therapeutics? How small is a nanometre? One nanometre (nm) is one-millionth of a millimetre (mm). A sheet of paper or human hair is about 100,000 nm thick. A strand of human DNA is about 2.5 nm in diameter and cell surface receptors are about 40 nm in size. The most exciting development in nanomedicine appears to be the deployment of nanorobotics in oncology. Nanorobots are ‘devices’ designed to operate in the nanometre scale. 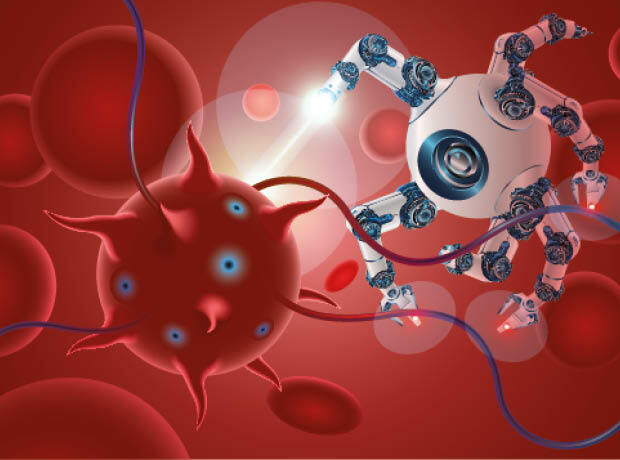 In February 2018, scientists from Arizona State University, USA and the National Center for Nanoscience and Technology in China, published their successful 5-year collaborations in deploying DNA nanorobots to shrink tumours by cutting off their blood supplies. These nanorobots originate as a sheet of DNA measuring 90 x 60 x 2 nm. The sheet is then folded as a cylindrical tube with a diameter of 19 nm and 90 nm long. It carries a therapeutic ‘payload’ to block the tumour blood vessels and a targeting agent that helps it to identify cancerous cells. The former is thrombin, a blood clotting enzyme carried within the tube, while the latter is a single-strand DNA (an aptamer) that targets nucleolin, a protein which is found in abundance and only in the endothelial cells lining blood vessels of tumours. Once the nanorobot reaches the target blood vessels, it exposes its payload, thrombin, which initiates the clotting process, leading to blockage of blood vessels, thus starving the tumour of oxygen and nutrients. Their nanorobots have shown positive results in shrinking melanoma and cancers of the breast, ovary and lung in mouse models: thrombosis occurred in all tumour vessels within 3 days and in melanoma, complete regression of the tumours occurred in 3 out of 8 mice, median survival time was extended from 20 to 45 days and vascular metastases were prevented; in a lung cancer mouse model, tumours were shrunk after 2 weeks. Crucially, the nanorobots didn’t affect cerebral vessels (which could have led to strokes), were immunologically inert (i.e. didn’t elicit any adverse immune response), didn’t affect healthy tissues and were eliminated after 24 hours. The nanorobots were then tested in Bama miniature pigs (which are physiologically and anatomically similar to humans) and it showed that normal tissues and clotting processes were unaffected. The institutions are now looking for partners to take their research into the clinical phase. Closer to home, Durham University announced in August 2017 that its nanorobots managed to kill cancer cells, literally. Together with researchers from Rice and North Carolina State universities in USA, their nanorobots are motorised molecules, forming ‘rotors’ capable of spinning at 2-3 million rotations per second. The rotors are so small that 50,000 of them would only occupy the width of a human hair. They sit on the surface of cancerous cells until activation by a shining UV light which powers them. It then burrows through the cell membrane to either deliver a therapeutic payload or as shown in an experiment, caused the direct death of prostate cancer cells within three minutes. They were working on small fish models, with plans to move onto rodents prior to human clinical trials, should the animal experiments prove successful. Another team from Canada is utilising a different approach to treat cancer. Researchers from the Polytechnique Montreal and McGill University have chosen bacteria to deliver therapeutic payloads. Their working thesis is that tumours grow at such a fast rate that they are tissues with low oxygen concentration. Their chosen vehicle is a strain of magnetotactic cocci, which as the name implies, contain a magnetic iron-oxide nanocrystal which acts as a compass, directing it to low oxygen environment. Chemotherapy drugs are encapsulated within liposomes (microscopic ‘bags’) and about 70 of them are strapped to the outer coat of each bacterium. In a proof-of-concept experiment, the bacteria were injected into mice a few centimetres away from their colorectal tumours. Computer-controlled magnetic fields were used to guide the bacteria towards the tumour site. Once near the tumour, the bacteria navigate by themselves (using their compasses and flagella, ie self-propelling tails), towards the most active parts of the tumour and deliver the chemotherapy. Microscopic examination showed that 55% of the 100 million bacteria injected into each mouse reached the low oxygen areas of the tumours. The bacteria were dead within 30 minutes, as the mice body temperature is too hot for them to survive. All these studies took place by August 2016; fast-forward to June 2017, and the technology appears to move a step closer to human trials. Clinicians at the Jewish General Hospital, Montreal, announced that they were seeking funding and pending approval from Health Canada to start human clinical trials by 2019. Nanomedicine certainly offer many upsides. It is decidedly non-invasive when compared to radical surgery, chemo- and radiotherapy; involving simple intravenous injections of millions of nanorobots. It would also appear that the efficacy of such treatments would be relatively rapid, accompanied by few adverse reactions (should the nanorobots prove to be immunologically inert) and spare healthy tissues. The potential of these nanorobotics to improve survival rates and decrease treatment-induced morbidity is great. Will our industry embrace nanotechnology as it once did with biotechnology?